While it is still technically winter, Southern California is abundant with great fruit and vegetables right now. Citrus is in its prime and there are countless varieties available at local farmers’ markets. Everything from Murcat mandarins, to Meyer lemons, to Kaffir limes, to kumquats, to tangerines, to pomelos are in season. I am particularly in love with the soft pink-colored-not-too-sweet Cara Cara oranges, and the deep red floral and slightly bitter blood oranges. This Sunday night marks the beginning of Tu B’Shevat, the Jewish new year for trees. While there aren’t too many customs and rules associated with the holiday, many Jews celebrate with a Tu B’Shevat seder and by planting trees. Some folks celebrate by eating as many as 15 different varieties of fruits and vegetables for the holiday. This salad is meant to celebrate the fruit that is in season now, and here during Tu B’Shevat. The recipe calls for both Cara Cara and blood oranges, but you can pick any of your favorite varieties of citrus (you could even add more than 3 varieties of citrus). 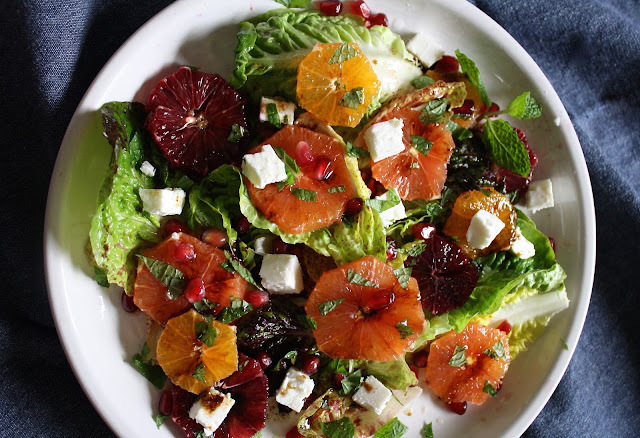 The idea is to pile up the citrus fruit on top of your favorite lettuce or greens, cover it with a layer of sweet and tart pomegranate seeds, good quality feta cheese, lots of bright fresh mint, and a drizzle of tangy pomegranate molasses vinaigrette. Pomegranate molasses is simply reduced/concentrated pomegranate juice. 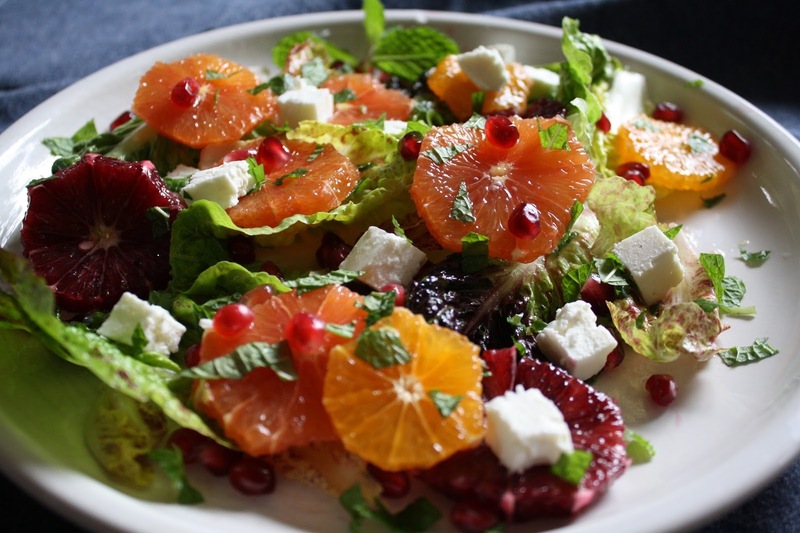 If you don’t have pomegranate molasses you can dress this salad with a simple combination of lemon juice and olive oil.